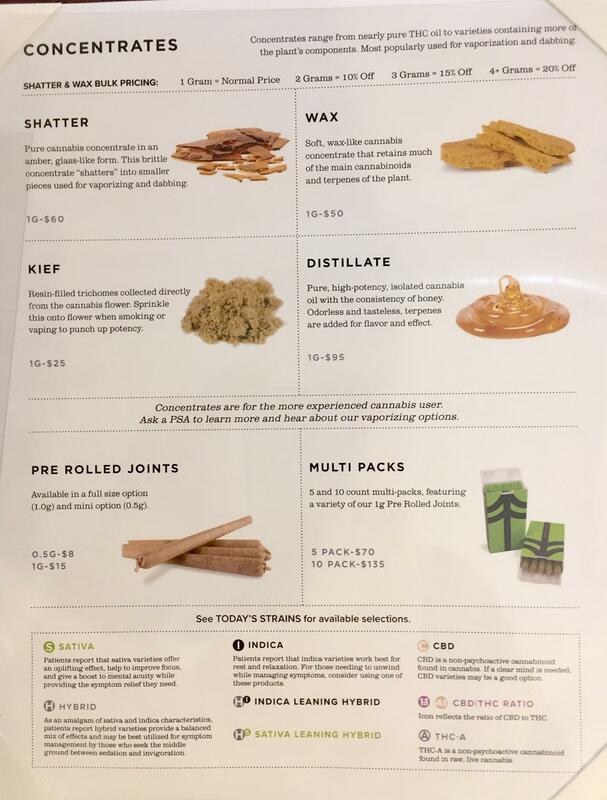 A page from NETA's medical marijuana menu. Norton Arbelaez, NETA's director of government affairs. The interior of New England Treatment Access, looking towards the new retail sales stations. The exterior of New England Treatment Access in Northampton, Mass. It's received final approval from the state's Cannabis Control Commission, but still has to satisfy a few requirements. New England Treatment Access has operated a medical marijuana facility in Northampton for three years and will soon start selling pot to adults out of the same location. It’s a one-story brick building near the highway. Norton Arbelaez, the company's director of government affairs, said that to buy pot, the first stop will be a security camera right next to the main entrance. “So you would have to show your identification to the camera,” Arbelaez said. And it doesn't have to be a Massachusetts ID showing a person is over 21. It could be from New York or Connecticut. After showing their identification, customers enter the security vestibule, a six-by-six-foot space, with an employee behind a window. The interior of New England Treatment Access, looking toward the new retail sales stations. The sales floor looks more like a modern bank branch than something out of a Cheech and Chong movie. Medical marijuana patients, who don't have to pay tax, will be directed to the left. Recreational patients will be directed to the right, after being handed a menu with pictures of giant buds known in the business as "flower." And if you don't want to smoke it, you can eat it. “We have our Belgian dark chocolate bar, comes in a 50 milligram and 100 milligram variety,” Arbeleaz said. “We have brownies, of course.” You can also buy cannabis suppositories. To accommodate retail customers, NETA converted some office space and added about dozen new sales stations. John Murphy, an assistant sales manager, explained how the process will work. 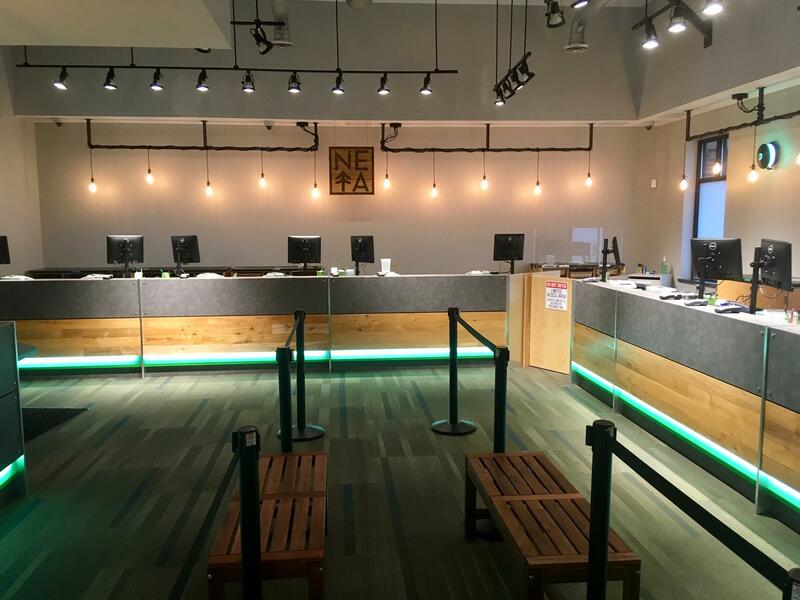 Being one of the very first retail marijuana stores on the East Coast means New England Treatment Access will need a lot of pot on hand. “We plan on purveying products from our production facility on a daily basis,” Arbelaez said. “Over the span of a year, we'll have to produce, you know, tons of cannabis." Arbelaez said the company must still clear a few hurdles to get the final green light from the state. He expects to be open for business before the end of October. Halloween in Northampton could be a little more interesting this year. The Massachusetts Cannabis Control Commission has granted final licenses to a pair of independent testing laboratories. Massachusetts marijuana regulators have issued final licenses to operators planning to open the state's first commercial pot shops, including one in Hampshire County.